Today’s students are non-traditional and the consumer mindset they bring to the table is forcing colleges and universities to change the way they operate. Where students once allowed the institution to dictate the terms of their experience—everything from where, when, why and how they engaged with the university—this is no longer the reality. Today, students want to set the terms of their experience. They want more personalization and customization from their institutions. Simply put, they want to enjoy an experience that matches what they have become used to in the consumer world. In this video, the first in Destiny Solutions’ video series The EvoLLLution of Higher Education, EvoLLLution Managing Editor Amrit Ahluwalia sheds some light on the impact the customer experience has on decision-making for today’s learners and reflects on how colleges and universities can operationalize this knowledge to provide the experience learners want. National Adult Student Priorities Report: Ruffalo Noel Levitz’s 2014-2015 overview of the adult student market identified some of the key priorities that adult students have when deciding where to enroll. Basically, according to the research, prospective students today are as interested in how they are treated as they are in the programs offered when choosing where to enroll. Student Experience and Efficiency Go Hand-in-Hand: In an interview with The EvoLLLution, University of Maryland University College Provost Marie Cini shares her insights on the role of institutional efficiency and effectiveness in strengthening the student experience. She identifies some interesting stats from an internal study and reflects on the differentiating power of efficiency for colleges and universities. 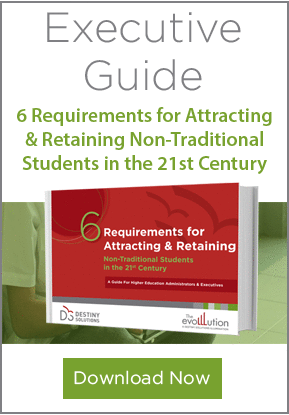 Six Requirements for Attracting and Retaining Non-Traditional Students: This executive guide by Destiny Solutions shares six key factors that can help your institution pivot and succeed in today’s higher education marketplace. It puts the focus on what it takes to understand, respond to and exceed the expectations of today’s non-traditional student customers. CE Focus on Customer Experience Would Benefit Main Campus: Since continuing education units are (1) typically self-reliant financially and (2) focused on the non-traditional audience, they have been focused on delivering a strong customer experience for a long time. This interview with Western University’s Director of Continuing Studies Carolyn Young outlines why main campus leaders should take the lead from their colleagues in CE when it comes to delivering an experience that resonates with today’s learners. What It Takes to Meet the Self-Service Expectations of Today’s Students: This article by Nancy Rubin, the executive director of distance and online learning for the Columbia Video Network at Columbia University, shares some really interesting insights into the importance of administrative simplicity for non-traditional students. Rubin also discusses the characteristics that make a website truly useful for today’s students. Ultimately, as the non-traditional student population has grown over the past 10 years, this consumer mindset has become standard for all students. Regardless of whether a student graduated high school 3 months ago or 30 years ago, they expect their institution to deliver an experience that matches what they see in the consumer world. It’s critical for college and university leaders to adapt to this shift, or their institutions will be left behind.